Armor of God Catholic Radio strives to have the best on-air signal as possible. We operate our transmitter at the Federal Communications Commission licensed parameters for power, antenna configuration, and modulation. We consistently search for ways to improve our signal quality and coverage, including consulting with communications and legal experts for ways to increase our power output. 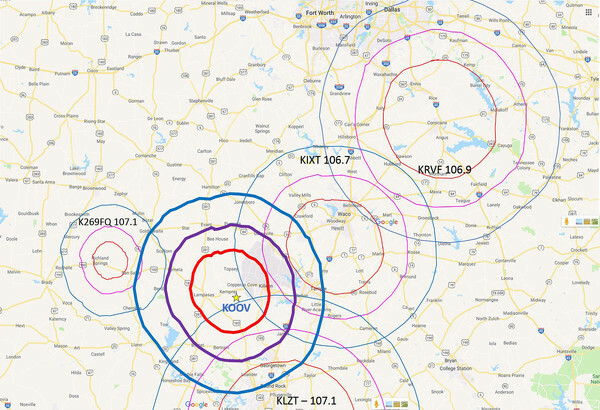 However, there are many other stations in our Central Texas area that are operating on our frequency or adjacent frequencies that could limit our expansion plans. All of our volunteer “engineers” work hard to ensure that we have a signal that transmits well. It is important to keep in mind, however, that radio broadcasting is a system that combines the performance of both the transmitter on our end, and the receiver on your end of the system. Often times, listening to Armor of God Catholic Radio can be very easy, requiring no special effort – turn on the radio and there it is. Other times – in parts of our listening area – there are opportunities on the receiver end of the system to improve reception – especially at home or in your office. We have compiled answers to some common questions below. If you have additional questions, or want additional information, please do not hesitate to contact us. And if all else fails, listen online! If you live or work in a dungeon, or a subterranean bunker, or somewhere that seems to be impervious to all forms of radio signal, do not despair! All of your favorite, faithful Catholic programming that you listen to in your car, can also be heard via our online stream. Simply go to www.armorofgodradio.com and click on the Listen Live link. Why can't I get the station in the morning or evening hours? During certain times of the year, an atmospheric phenomenon called “thermal inversion” affects our signal. Basically, cool, humid air occasionally gets trapped below a blanket of warm air. The signal then “skips” along the top side of the warm air blanket, reflecting it into space—it can’t penetrate the cold air down to your radio. The problem is worse in the early mornings, just after the coolest part of the night. There is nothing that we can physically do. Fortunately, the problem resolves itself as the rising sun warms the earth and the air layer above it, usually taking place as the morning progresses. All that is to say there isn’t much that can be done—except hang in there with us! Why is reception good one moment, while not as strong the next? FM transmissions are line-of-sight. That means that obstacles between you and the transmission you’re trying to receive can block the signal and leave you with poor reception on your radio. A hill, a coliseum, big buildings – all these things can get in the way of your FM reception and even leave you hearing the effects of multi-path interference – or multiple radio stations at the same time. How might I improve my reception? One of the easiest solutions to a reception problem is to move the radio to a different part of the room. Moving the radio only a few inches or several feet sometimes will bring in a clear signal. Most portable and clock radios use either a telescopic whip or the AC power cord as an antenna. The whip can be extended, retracted, and rotated to change reception. We recommend placing the radio close to a window or pointing your antenna to the window, as that lessens the amount of inference with the signal. If you are using a clock radio style receiver, the antenna is probably in the power cord. For best reception, try stretching the cord out to it’s fullest length. You may have to move the cord around, drape it over the corner of the table or another object, or you may simply need to move the clock radio. It is possible that the signal can’t get to your clock radio because of all the other things (electronics, wiring, insulation, etc) in your house. If playing around with the antenna or moving the radio around doesn’t improve your reception as much as you like, you may need to move toward a more powerful indoor or outdoor antenna. An option for an internal antenna, for a radio that has a coaxial connection (usually on the back), is a simple set of ‘rabbit ears’. 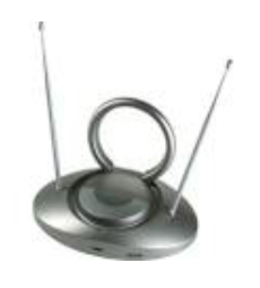 These electrically amplified antennas can be found at most retail stores, for $30 or less, and are a very good way of boosting the reception of the Armor of God signal inside your home. (Note: we strongly recommend that you ensure that the store will give you a full refund if the antenna doesn’t solve your reception problems.) The best location is typically near a window where other electronics, the microwave, or your television can interfere. The antenna connects to either two screw terminals marked 300 Ohm or an "F" connector for coaxial (round) cable located on the back of the unit. Connect the rabbit ears to your radio and then move the individual ‘ears’ until the signal is strongest. For those of you are “DIY-ers”, you can create your own antenna – a simple dipole antenna – with just a few feet of flat twin-lead antenna wire. To get the best reception of the 106.9FM signal, your overall length of your antenna needs to be 9-10 feet. Take the length of the antenna wire, strip and twist together the ends. At the center on ONE side of this ten-foot section, strip bare just about 1-2 inches of the wire. Using a second piece of wire (the length of this piece depends on the distance between where you want to hang or place your dipole and the receiver, but should be at least 5 feet long), connect it to the bare wire that you stripped back on the previous step. When the dipole is stretched out and rotated, it’s possible to point the antenna for best reception or to "null" a station that is interfering with the Armor of God signal. The disadvantage of the dipole is finding a way to locate it in the room. If you are lucky, the direction of the Armor of God signal will correspond with one of the walls in the room and you can simply attach the stretched out twin-lead to the wall. Some people mount the dipole on a "TEE"-shaped frame made of wood and position it in the room for best reception. Since most of us have a spouse that may not appreciate our ‘genius’ at having created our own antenna, it might be best to hang the wires over the rafters in your attic. An outdoor unidirectional antenna, also known as a Yagi, is a powerful option. 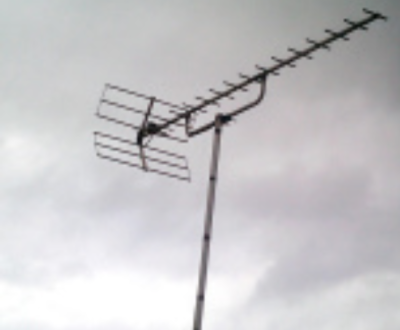 A Yagi looks like a rooftop TV antenna and is ideal for tuning in distant stations and for reducing multipath interference. By aiming the Yagi at the signal you want to capture, you can tune out most types of interference – be it from competing signals, buildings or a weak signal. Another alternative in outdoor antennas is an omnidirectional FM antenna. Though omnidirectional antennas might not reduce interference as much as unidirectional antennas, their ability to pick up stations cleanly from all directions make them a good choice for overall reception. FM reception are referred to as "line-of-sight." This means the transmitting and receiving antennas must be able to "see" each other. Since FM radio waves travel in a 6-foot-wide pattern, using an antenna with large individual elements will help ensure that you collect as much of the signal as possible. Rooftop antennas used for television also work well for FM bands, as do telescoping antennas with masts extending to 3 feet or more. As with any antenna, height and surface area are the two strongest weapons against weak reception. For this reason, you should always select an FM tuner with an external antenna connector if sound quality is important. Many people use antennas limited to indoor use. In such environments, it's better to extend the antenna as far as possible. Placement close to a window and away from brick and steel if possible is ideal. The best scenario involves finding a window that faces the Armor of God signal – or is in the direction of Kempner – and pointing the antenna out that window. See above for suggestions about internal antennas including rabbit ears and dipole antennas. 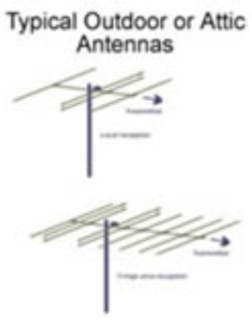 For reception farther away from the transmitter site or when using an outdoor antenna, a roof or attic-mounted antenna is recommended, both for the increased height and for the additional antenna gain (the increase in signal strength) that comes with a directional antenna. Directional antennas also may be mounted in the attic, still providing increased height over lower level locations. See below for our discussion on outdoor antenna mounting suggestions. Fluorescent lights, microwaves and other similar electronic devices wreak havoc on FM signals. Turn off such equipment whenever possible if you are attempting to get the best FM reception. If the devices must remain on, mount the antenna as far away from them as possible for optimum reception. Although it may seem counter-intuitive, switching to mono often alleviates many of the static and audio artifacts associated with fringe FM reception. Stereo FM sounds better when the signal is strong and reliable. To enjoy hard-to-receive stations or for cleaner overall sound, switching from stereo to mono is a proven solution. If you install an attic or outdoor antenna, be sure to follow good engineering practices by twisting the twin-lead (flat) cable and mounting on stand-offs, or by using coax (round) cable. Always ground the antenna and the lead-in cable. Always use "splitters" or "couplers" for multi-set installations or joining several antennae to one lead-in cable. These practices ensure the rejection of unwanted and interfering signals being picked up by the cable (or sometimes retransmitted by YOUR antenna to the neighborhood) and afford protection against lightning. Books on a proper antenna and lead-in installation can be found in many libraries or at electronic stores. Why is Armor of God Radio's signal range the size that it is? Simply put, the FCC has rules that regulate how much stations that share the same frequency (co-channels, KOOV 106.9FM in our example) and their 1st adjacent channels (106.7FM and 107.1FM) can overlap in strength. There are many calculations that go into these regulations such as distance, terrain, antenna height, etc. - for extensive details on these rules, click on this link and see 47 CFR Part 73.507 to 509. Red represents the city-grade protected contour of each station in which there should be no interference between co-channels and 1st adjacent channels. Purple represents the distant contour in which only a small percentage of overlap is allowed between co-channels and 1st adjacent channels. Blue represents the fringe contour, in which there can be some expected and allowed overlap in the signal. As you can see, we are not allowed to expand our station's reach due to these rules on interference. However, Armor of God Radio can be picked up quite well even in the “fringe” contour represented on the maps above.